The Smartest Man That Ever Lived? 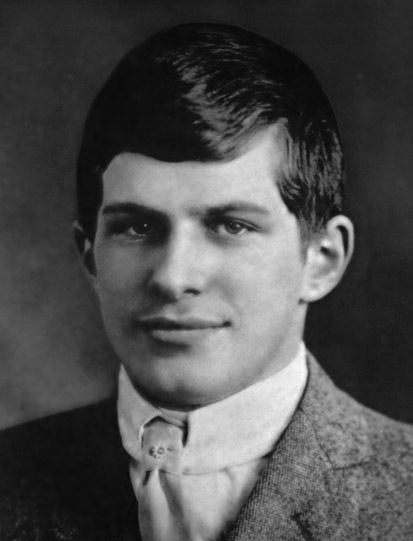 William James Sidis (1898-1944) was born to Ukrainian Jews who fled to America because of the pogroms. Sidis was quickly recognized as a child prodigy. His parents were geniuses in their own right – doctors, polyglots and professors – but Sidis would outdo them both. At 1.5 years, he was already reading the New York Times. At age 4, he wrote his first book (in French). By 8, he spoke fluently in English, Russian and Hebrew, as well as Latin, Greek, French, Russian, German, Armenian and Turkish. He later invented his own language called Vendergood. 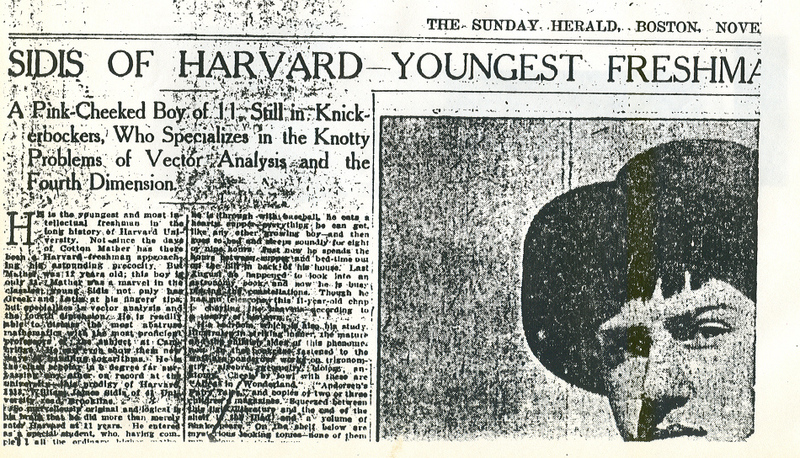 At age 11, William enrolled in Harvard, becoming the youngest person in history to do this. A year later, he was lecturing at the Harvard Mathematical Club. At 17, he had a teaching job at Rice University, where he wrote a geometry textbook in Greek. At 21, he was thrown in prison for participating in violent Communist rallies. After his release, he lived in seclusion and isolation until his death of a brain hemorrhage at age 46. He spoke 40 languages. 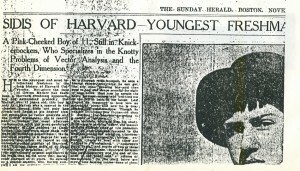 New York’s Aptitude Testing Institute placed his IQ between 250 and 300, giving him the highest intelligence quotient in history (in comparison, Einstein’s was around 170). Despite his genius, he appears to have left no legacy. Much of his life remains clouded in mystery. A person is forbidden to eat before he feeds his animals. This entry was posted in Extraordinary Individuals and tagged American Jews, Armenian, Einstein, English, French, Genius, German, Greek, Harvard, Hebrew, IQ, is william sidis jewish, Latin, New York Times, Polyglot, Rice University, Russian, Turkish, Ukrainian Jews, was william sidis jewish on September 14, 2011 by Jew of the Week. Couldn’t find any information on his grandparents, but I imagine they were typical of Jews in Ukraine at the time: living in small, impoverished towns. With regards to occupation, he held small jobs like running adding machines, and the rest of the time he spent writing articles and publications, as well as teaching small private groups. Good question – couldn’t find any books on Vendergood, but there are plenty on William Sidis himself. I’m sure there’s something about it bound up in there. What are the basics of Vendergood, the language invented by William James Sidis? Where i can find this book?